Susie and Woody soaring high and fast. 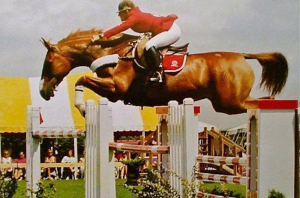 SAN DIEGO — Twelve years to the day after his passing, Samsung Woodstock, the chestnut gelding who won scores of show jumping honors and the hearts of fans worldwide, received the California Professional Horseman’s Association Equine Lifetime Achievement Award. The presentation, made to his career-long partner, Susie Hutchison, was a highlight of the Jan. 5 Awards Banquet held this year at the Manchester Grand Hyatt on San Diego Bay. “There was never a course I walked that looked too high or too wide — that I didn’t know we could do it,” said Hutchison, who is competing at the HITS Coachella circuit. Her first win on the 16-1-hand “Woody,” in the 1987 Derby in Pebble Beach, came just days after the German-bred Westphalian had arrived from Europe. 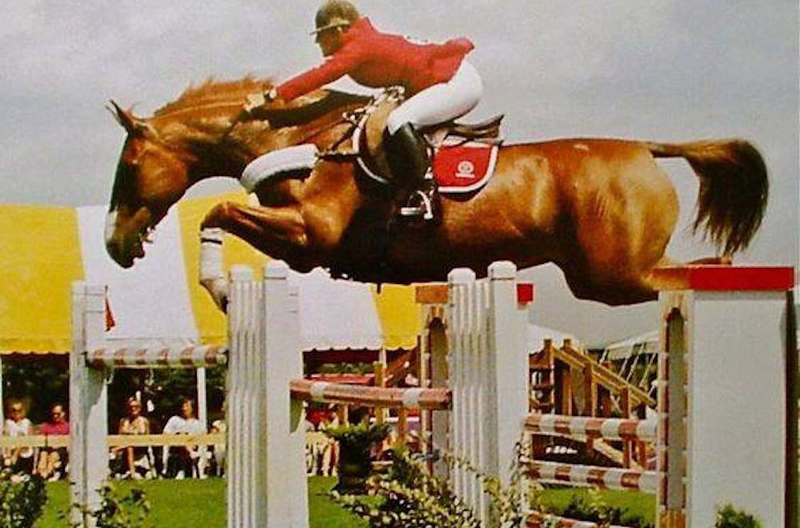 Their final victory at the 1997 Los Angeles National Grand Prix capped a career that featured 20 grand prix wins, plus qualifications for the World Equestrian Games and three World Cup Finals, the 1990 PCHA Horse of the Year Award, and the 1992 AGA Rider of the Year honor. In 1997, Breyer Animal Creations issued the Samsung Woodstock model horse. This was a team of three, though. The late Jimmy Williams influenced this pairing from the day he acquired the horse from Paul Schockemohle for owner K.H. Lee, ten Chairman of the Samsung Electronics Corporation, before the 1988 Seoul Olympic Games. Williams often rode Woodstock around bridleless, and he loved to have Hutchison show him in his invention that became known as “the bridleless bridle” — essentially a ring in his mouth. Fellow AGA Rider of the Year Hap Hansen once recalled an unforgettable moment at the World Cup Final when Susie brought Woodstock in a halter in front of the FEI Stewards for the jog before the class.